Brand identity and implementation for a sports and education camp that introduces kids to cultural diversity and new experiences. Camp Hokulea approached us with a blank canvas to build their visual identity, where our goal for the project was to bring life to their motto: Health, Teamwork, and Imagination. Hokulea is the star that acted as a guide to the voyagers who first discovered the islands of Hawaii. Camp Hokulea’s vision is to act as an inspirational guiding star that would help the kids to explore and discover their passion at an early age, all the while experiencing the beautiful islands of Hawaii. Based on this simple yet memorable metaphor, we created Camp Hokulea to introduce a vibrant identity that can shine brightly through all mediums. Use of refreshing colors, robust yet friendly typography, playfully subtle graphics, and beautiful Hawaiian imagery all add up to create an inspiring and optimistic personality. Playful yet sincere design language with bold contrasts. Camp Hokulea’s unique luminous color creates a strong connection with the viewers and instantly communicates a sense of optimism. This identity was cohesively applied in Print Design ranging from brochures, posters, and advertisements to give the brand a simple and clear voice. The color’s presence is also supported by the use of bold typography. But in order to balance out the powerful color and typography, design compositions remain simple and straightforward. And the hand-drawn graphics were used to give a whimsical personality in a subtle way. Maintaining the core identity while staying flexible. With Camp Hokulea’s holistic identity, the brand is able to retain its visual personality while still being able to adapt to future updates. 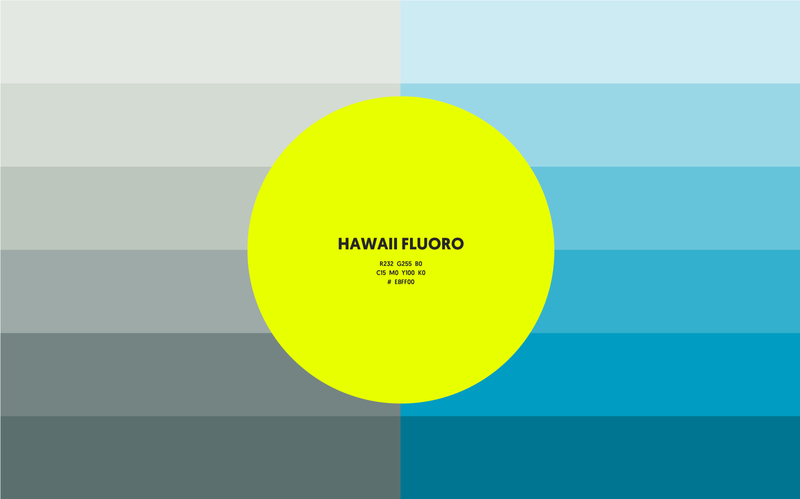 Subtle changes in environmental tones and clean use of Hawaiian imagery allow the brand to have visual depth, while their unique identity elements remains highly recognizable.